It’s 2040, and New York City’s Triboro Line—24 miles of once abandoned railway tracks stretching from Sunset Park in Brooklyn to Co-op City in the Bronx—has become a vital part of the urban transit system for 100,000 daily riders, a catalyst for economic growth, and a place for recreational activities. Once hidden below street level and behind trees, the rail lines of the Triboro now efficiently link people and goods moving between Brooklyn, Queens, and the Bronx—all without going through Manhattan. Travel times along the route have been reduced, with service every five to 15 minutes, enabling a passenger from Parkchester, in the Bronx, to get to her housekeeping job in Astoria and home in time to pick up her child at daycare. New manufacturing businesses are thriving in Ridgewood Queens, and freight deliveries arrive on time from a Hunts Point food distributor to a customer in East New York, a delivery that previously went by truck. All along the route, cyclists and pedestrians enjoy a car-free greenway and new parks, while the elderly and disabled easily access trains. The Triboro Line was a valuable asset waiting to be developed. It covers 80 square miles in area with a population of 2.6 million people, one of the most diverse communities in the city, and a large aging population. It intersects with 17 subway lines and four commuter trains. Before the Triboro, commute times were often long, and access to reliable transportation inconvenient, especially for those who didn’t commute to Manhattan. When it was built, nearly 60 percent of households in the Bronx and Brooklyn, and 36 percent in Queens, did not own cars, making the Triboro a critical link to get to work or school, and for recreation. These challenges will only grow as NYC jobs grow. Fifty percent of NYC’s job growth has occurred outside of Manhattan in the last 15 years, and that’s only projected to continue. The Triboro Line took some time to build, but cost less than $2 billion, less than other projects like the Second Avenue subway. New signals and track were added, and a few new substations, as well as a complementary network of urban greenways and open spaces. The existing track was either raised, sunken, or decked, and connecting bridges and tunnels were built to improve access to stations. The rail right-of-way is now intact and fully grade-separated, which required structural improvements. The line was built in a way that protected existing residents and businesses. Legal protections against displacement started in East New York, and extended throughout the corridor, enabling many families to remain in their homes. 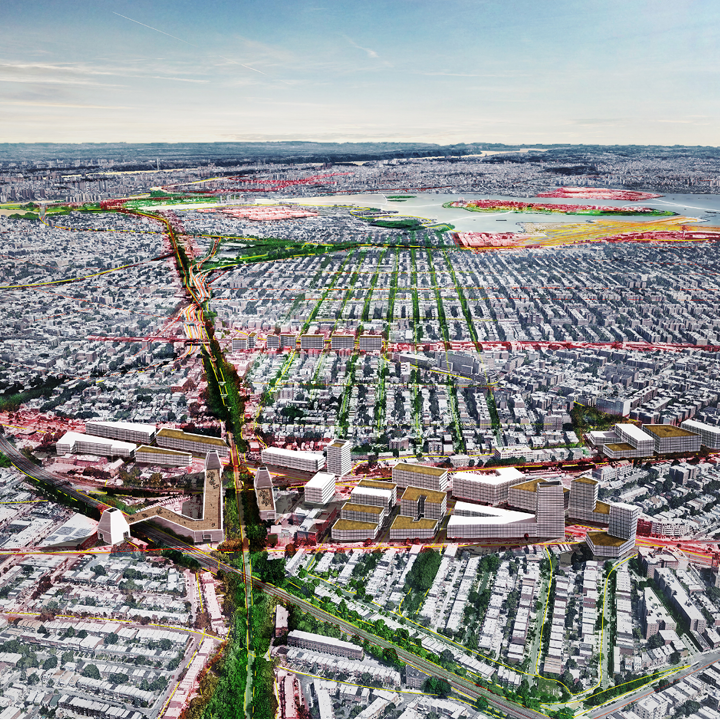 New stations were designed around centers of activity: a revitalized industrial district in Sunset Park, an expanded college campus above the line near Brooklyn College, an expanded mixed-income neighborhood in East New York, a new intermodal mixed-use node near Queens Boulevard, and a regional goods-distribution hub in Hunts Point. Most of this development was incremental and carried out with close community cooperation, rather than large development proposals that transformed large areas at once. Some 9,000 acres of government-owned land were redeveloped as open spaces, and new businesses funded vocational training programs linked directly to small-scale manufacturing. As in other major cities (see Chicago Metra example), the Triboro Line was built to accommodate both passengers and freight. The movement of food into NYC followed projections, and increased 61 percent by 2035, following a dramatic rise in population growth. 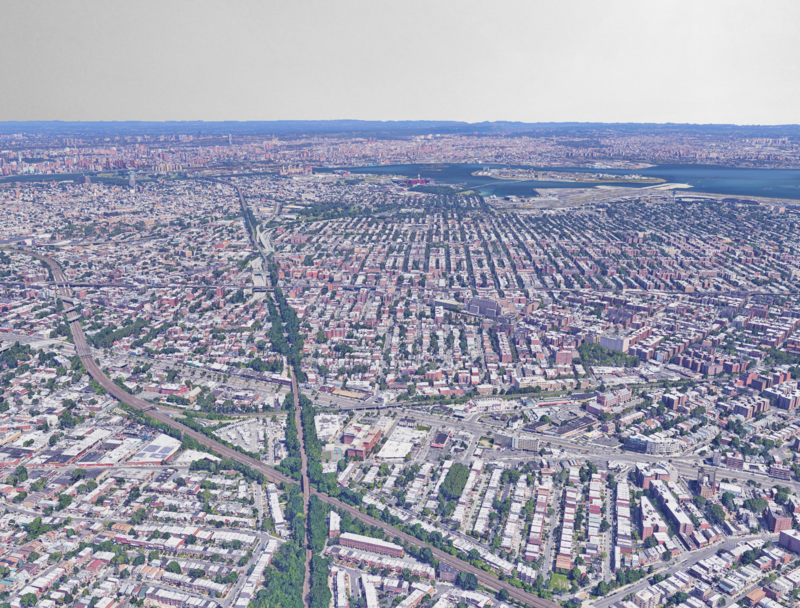 With the Triboro freight connection, congestion and truck traffic in Hunts Point has been reduced and the cleaner air has led to lower asthma rates. 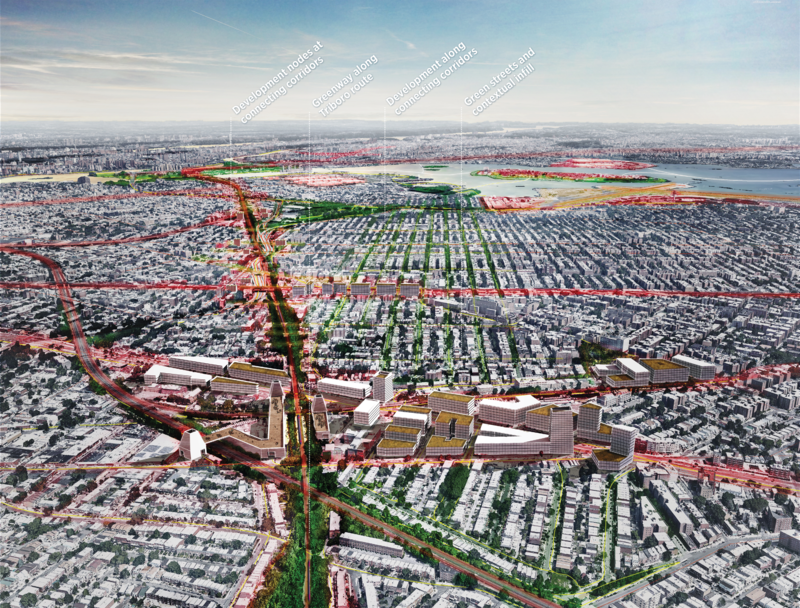 The Triboro did more than just improve regional mobility. It also addressed inequities in the transit system, gave more people access to jobs, created opportunities for affordable housing, improved public health in an area with high rates of obesity and asthma, and made the transportation network more resilient to storms, flooding, and other disruptions. The Triboro Line brought workplaces closer to the workforce, particularly for economic sectors not traditionally centered in Manhattan, such as education, health care, logistics, manufacturing, and food. Designed for an older and more diverse population, the new transit option has shown how a city can meet a citizenry’s evolving needs and capitalize on its existing assets.